Creating jewelry that delights the eye and is a joy to wear is the goal of the owner of today's shop. LeAllyson, from Plumbeadacious on Etsy, loves making jewelry and enjoys working with a variety of materials to create her designs from lampwork beads and crystals to Czech glass beads, freshwater pearls, semi-precious stones, lucite beads and more. Her shop is filled with a variety of handmade beaded jewelry designed with the joy of creativity behind it and a love for color inspiring every piece. 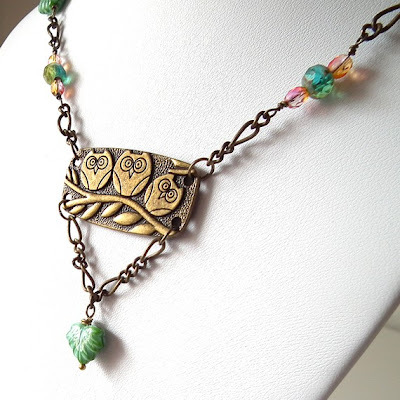 LeAllyson creates her design with the hope that each piece will delight the eyes at the same time a being a joy to wear. LeAllyson's shop has a variety of items to browse through. There are bracelets and earrings, necklaces and purse charms as well as beaded lanyards, rings and even a few hair accessories! She also accepts custom orders if you don't find exactly what you're looking for on a first glance. YOU CAN CLICK ON THE PICTURE ABOVE TO VISIT PLUMBEADACIOUS ON ETSY AND TAKE A LOOK AROUND OR, IF YOU PREFER, YOU CAN CLICK RIGHT HERE. You can also visit LeAllyson on her Beadaciously Yours blog or her Facebook page, or stop by and take a look around on her Plumb Beadacious website! Thanks for your lovely feature of my shop.